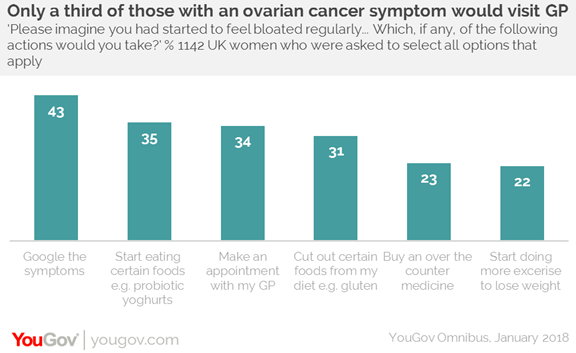 February 27, 2018, 9:34 a.m.
Just over a third of UK women would visit a GP when experiencing bloating, which is a major symptom of ovarian cancer, new research commissioned by Target Ovarian Cancer shows. YouGov Omnibus data shows that many wouldn’t consider consistent bloating a serious worry, with only a third (34%) saying that they would make an appointment to see their GP if they were experiencing it. Many would make a change to their diet if they were experiencing bloating, with three in ten (31%) saying they would cut out certain food types such a gluten or dairy. In contrast, 35% would add certain foods to their diet, such as peppermint tea, probiotic yoghurts or cereals with fibre. Some women (22%) say they would use exercise to combat the bloating by losing weight. 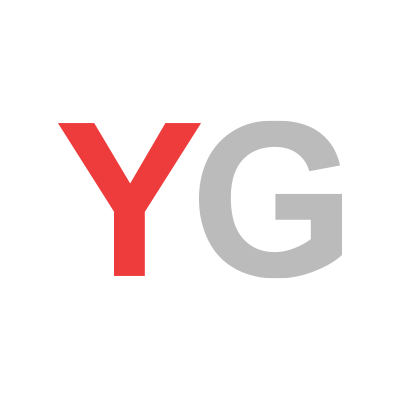 Young women are the most likely to do this, with 44% of 18-24s using this method. This is compared to 30% of 25-34s, 26% of 35-44s, 13% of 45-54s and 14% of those over 55. Older women are the least likely to google what their bloating could be a symptom of. While four in ten (43%) of the general population would do an internet search, just 34% of those are over 55. Young women (aged 18-24) are the most likely to go straight to the internet for answers (64%).